Usually when one ends up sideways while driving in snowy conditions it's cause for alarm, rather than celebration, but then again most people aren't experiencing their tail-out scenario within the safe confines of ICAR's race course. 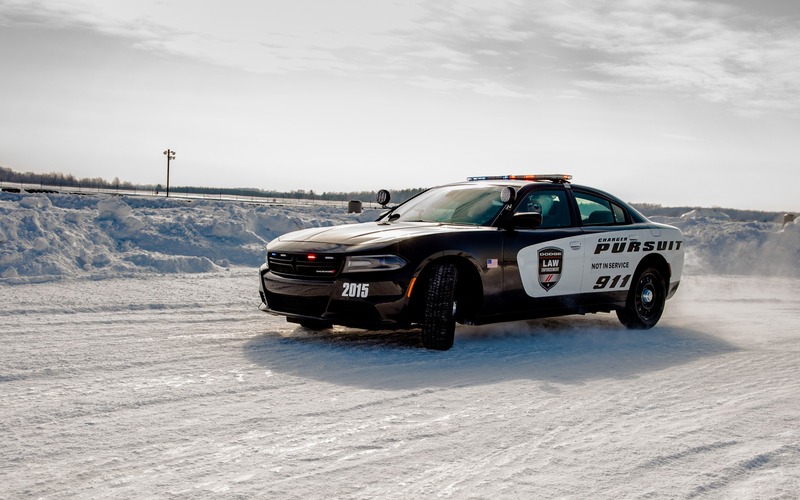 Located just northwest of Montreal, the full-service high performance driving facility was hosting Chrysler's winter driving program, which was designed to highlight just how capable its four-season fleet was in the face of slippery, icy roads. Fiat Chrysler Automobiles Canada, as the corporate umbrella is now known, has made a strong effort to offer all-wheel or four-wheel drive on the vast majority of its offerings. In fact, you have to look to either minivans or recent captive imports like the Ram ProMaster and ProMaster City, as well as the Fiat 500 and Dodge Dart (based on a Fiat platform) to find models that only spin the front wheels (with the Dodge Challenger keeping things old school with its rear-wheel drive only configuration). As a result, when I arrived at ICAR, almost the entire Chrysler/Ram/Dodge family was arrayed before me, key fobs in the console, waiting to be abused - I mean evaluated - by way of a series of short and long snow courses carved out by ICAR's team of professional drivers. And what a variety: everything from the Ram EcoDiesel's automatic four-wheel drive system to the traditional locking differentials of the Ram 2500 Power Wagon to the disconnectable four-wheel drive found in the Chrysler 200 and the Jeep Renegade was available for testing. Why so many different all-wheel and four-wheel drive designs? It comes down to how drivers intend to use their vehicles, not just in the winter but also on and off the road during more pleasant weather conditions. For mid-size sedan shoppers, a system like that found in the Chrysler 200 that can automatically disconnect the rear wheels when they are not needed is ideal, as it means not having to pay a fuel efficiency penalty in exchange for the benefit of four-wheel traction (which kicks in automatically once wheel spin is detected). The Chrysler 300 and Dodge Charger full-size four-doors reverse that design to take the front axle out of the equation in normal driving. A similar axle-disconnect philosophy guides the all-new Jeep Renegade, which adds the extra wrinkle of a low-range, lockable four-wheel drive system in order to facilitate trail driving. The Dodge Journey - one of the last legacy platforms left in FCA's increasingly turned-over family of vehicles - doesn't completely disconnect the rear wheels but simply shifts power back and forth between the axles as needed, a design that is effective but unfortunately one that also sips fuel at a more accelerated rate. For more utilitarian applications like the Ram family of pickups low-range four-wheel drive is the order of the day, but you can still benefit from an automatic setting with the Ran 1500 (EcoDiesel and gasoline engines) that kicks in to direct torque to the front wheels as required. The Ram Power Wagon goes a step further by introducing locking differentials that can be brought on-line at the touch of a button when traversing a particularly difficult series of obstacles in four-wheel drive low (but you lose auto mode as a result), as well as a front axle disconnect to improve efficiency when set to two-wheel drive. As expected, the Jeep Grand Cherokee and Jeep Cherokee offer the most nuanced list of available four-wheel drive systems. The former delivers four different flavours of 4x4, including the range-topping Quadra-Drive II, while the Cherokee brings a trio of four-wheel drive systems to the table (including the ability to lock up its rear differential and engage low-range gearing alongside more street-oriented options). The Jeep Wrangler's rugged four-wheel drive options showcase a standard low-range system alongside the Wrangler Rubicon's Rock-Trac two-speed transfer case and Dana 44 axles. Now that I've overwhelmed you with the full panoply of FCA's all-wheel/four-wheel drive engineering prowess, I'm sure you are curious as to how each of these respective systems handles real-world (or at least, closed-course) conditions. The answers might surprise you. For starters, as a fan of momentum transfer and Scandinavian flicks, I typically switch off a car's traction control system when negotiating a performance environment, even in the winter time. From behind the wheel of the Chrysler 200, however, I found that the car's electronic nannies actually worked with me, rather than against me, in moving the car around a slick corner as quickly as possible. Indeed, with traction control active I had no issues rotating the sedan around the apex of a rather sharp hairpin, as opposed to the lack of throttle response afforded with the system switched off (stability control is on, all the time, in every Chrysler automobile). This wasn't the case across the board, as each member of the fleet had its own quirks. The Jeep Renegade was perfectly willing to pivot through the sharp confines of the slalom, but its short wheelbase had it lost out on the larger course where it resolutely ploughed through corners with intense determination (as did the Dodge Durango). The Ram EcoDiesel and Power Wagons, in contrast, were able to swing their lengthy frames around pylons with complete control, a characteristic they shared with both the Dodge Journey and the Dodge Charger Pursuit Package (yes, that's right, I flicked a cop car around a snow course all morning, lights blazing and siren screaming. I am sure that I made a lot of friends in the process). We were also given access to a short off-road course, where the Power Wagon, Cherokee, and Renegade proved themselves more than capable of devouring the slippery humps, hills, and off-camber corners that were intended to trip-up their four-wheel drive systems. It's important to remember that as impressive as all-wheel and four-wheel drive technology is, choosing the right winter tires for your automobile will make a huge difference in your ability to stop and steer in the snow. Each of the vehicles I drove at the Chrysler event was outfitted with the right cold weather rubber, which was crucial to maintaining control at all speeds. With the right set of tires and the new fuel-saving designs currently available on the market, it's no surprise that Canadians are gobbling up all-wheel and four-wheel drive cars, trucks, and SUVs at a rapid rate.